Frank lives along the Mississippi River, and has leveraged his many life experiences to write The Foundry, the lead story in the Dianis, A World In Turmoil chronicles. He was born and raised in Detroit, Michigan where he and his father cruised the Great Lakes. Frank spent six years in the US Navy chasing Soviet submarines during the ColdWar. His love of the sea is reflected in The Foundry, and again in The Matriarch, a love he has shared with his wife and two girls. As a hunter, Frank has taken game with a variety of weapons,including the muzzleloader, the device modeled in The Foundry and used as the weapon against the pirates in The Matriarch, and against the Drakans in The Citadel. He assists his wife in her passion for horses. Equines appear regularly in the Dianis series as eenus. He has two degrees, a Bachelor of Computer Science and a Master of Business Administration. Those degrees have been integral to his professional life where he has worked in a variety of roles from software engineer, to marketing executive, to chief information officer, at such prominent firms as SAP and Organic Valley. The technical and scientific acumen he gained through those endeavors is demonstrated in the series in the effort to make the Dianis brand of science practically possible somewhere in the galaxy. The Foundry: Dianis, A World In Turmoil is a science fiction tale by author Frank Dravis, and is the opening novel to a new series focusing on the planet Dianis. In a galaxy fraught with war by the fearsome Turboii, the world of Dianis is classed as a primitive planet, which must be protected. Our hero is cultural anthropologist Chief Inspector Achelous Forushen, who has been working on Dianis up until he is mysteriously due to be seconded elsewhere. The fact that Achelous’s secondment coincides with finding a rare and powerful resource under the surface of Dianis makes him suspicious that this primitive little world might not stay protected for much longer, and he decides that he’s prepared to do something about it. The Foundry: Dianis, A World In Turmoil is a deeply involved and intellectual work that deserves high praise indeed. 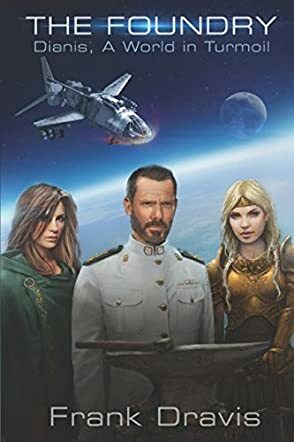 The plot surrounding Dianis and its place in the wider political landscape of the galaxy is extremely well constructed and realistically developed, and author Frank Dravis writes in detail without overdoing the information we’ve given. In a mixture between the social and scientific worlds, Achelous Forushen is a well rounded character with true emotional connections to the people and the planet for which he feels a responsibility. His relationship with Marisa and Boyd is heartfelt, and his leadership in the revolt against Nordarken Mining is inspiring without overdoing the heroics. Overall, I’d highly recommend The Foundry to readers of serious science fiction who are looking for a high quality read in which to immerse themselves.